Help Flo and Grandma Florence keep starving actors satisfied! 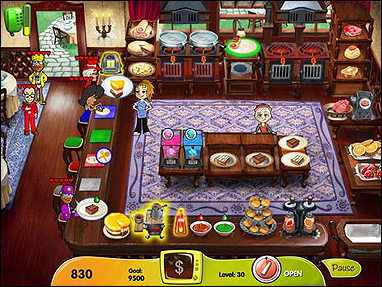 In Cooking Dash – DinerTown Studios, the sequel to the first installment of the highly successful Cooking Dash series, Flo has been invited by Gilda her roommate to the set of her new TV show. Flo doesn’t hesitate (indeed, who would refuse the chance to mingle with huge Hollywood Blockbuster stars?) and immediately jumps at the opportunity, taking Grandma Florence and Cookie with her! In this extremely addictive Time Management game Flo’s job is to seat actresses, agents and production assistants as soon as possible, while keeping an eye out for matching seat colors. If you manage to match the colors you get a bonus, and the more consecutive matches, the larger the bonus. Once seated you need to take their orders as fast as possible and serve them their steaks, burgers & fries, salads, yummy donuts and ice creams. If customers are pleased with your service and the food, they may also ask for a slice of cake, which earns you extra bonus points! The aim of Cooking Dash – DinerTown Studios is to make as much money as possible while serving customers, which you can then use to improve your Diner with an extra grill, a coffee machine or even an extra worktop so Grandma Florence can prepare multiple dishes at the same time. Adding some new light fixtures and refurbishing the service counter will improve your décor and the jukebox will loosen your customers up a bit so they are slightly more patient while waiting for their food or to be seated. 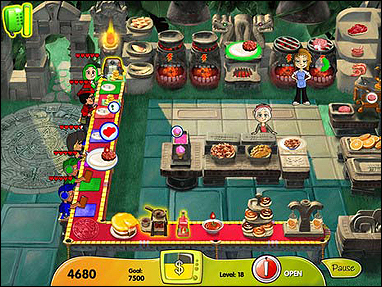 Cooking Dash – DinerTown Studios features 50 levels in Story mode across five different film sets, including Western and Royal Court Themes. Alternatively, you can play in Endless mode, where each stage can be replayed with three different levels of difficulty: Easy, Medium and Hard. In addition to the usual customers you get to meet new characters like the Director and Starlets. 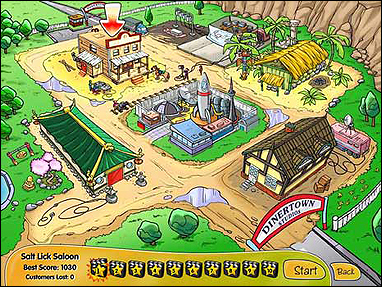 Pay close attention though as each character has a different attention span and level of patience. Plus some customers can be noisy with their cell phones so it’s best to seat them next to Production Assistants with headphones rather than those spoiled Starlets! While this may sound easy enough, the game gets very hectic early on and you (literally!) need to be quick on your feet. Luckily you can earn various power-ups, which vary from increasing your walking speed or Grandma Florence’s cooking speed or giving customers a patience boost. And of course, one mustn’t forget the Cookie-Meter, which recharges every time you deliver a few correct orders and allows you to summon Cookie to help you prepare the food! With bright and colorful graphics this really is a fun and fast-paced game. So, what are you waiting for? Get over there and start helping Flo and perhaps be “discovered” as the hottest new thing in Hollywood! 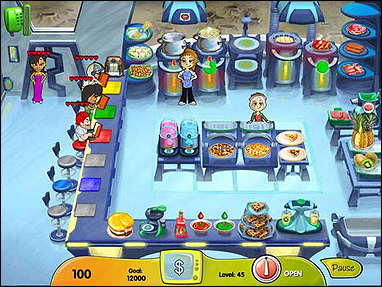 Download and play Cooking Dash – DinerTown Studios for FREE now! please remove your web-site from my e-mail address,thank you,richard.